What if everyone around you were a doppelganger... and only you didn't know? Background on doppelganger social structure, including their various life stages and their relationship to mimics. Details on how the doppelgangers have penetrated human society. New feats and skills for doppelgangers, plus the dreaded Protean Warrior class. Unique campaign ideas centered around doppelgangers. 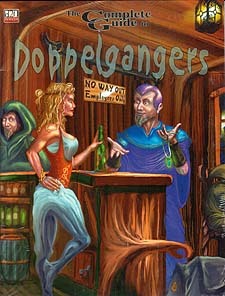 The Complete Guide to Doppelgangers is the third volume in the Complete Guide series. Each Complete Guide is exactly what it sounds like: a complete guide to playing a given kind of monster. As a GM, you'll learn how to run that monster, both in combat and role-playing situations. And since every Complete Guide includes guidelines on playing the monster as a character race, players have new options, too. The Complete Guide to Doppelgangers can be inserted easily into any fantasy setting.